Russian bar performer TOMCHUK attracted the audience with their power and beauty. Russian bar is one of the circus acts originally from Russia. 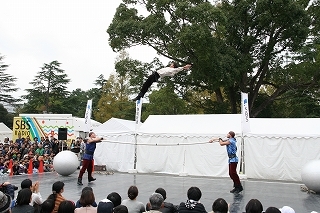 2 porters support a 5-meter-long bowing bar and the flyer jumps on the bar as if he / she jumps on a trampoline. Zhenya, the flyer, jumps gorgeously with cool expression. He looks like a ballet dancer, and his grace makes the audience forget a dangerous position for a while. Igor Tomchuk supports the performance physically as a porter, and mentally as a leader. 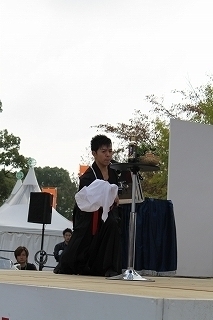 After he had experienced various kinds of circus acts, he always has kept trying new performances. Now his Russian bar is above the balls! It is very lucky for us to watch their performance so far from Ukraine. Thank you for coming to Shizuoka and hopefully we will see you soon again! We look forward to watching more advanced Russian bar next time. for the first time in the last 6 years! sometimes softly, and sometimes vigorously. and soon to be enchanted by a surreal experience in the world of Canard Pekinois. that says "preparing" in front of them. the World Heritage, no, the Universal Heritaeg! This is the greatest honour to us!" and the overwhelming universal-scale appeal proved their powers of persuasion. Lastly, here is useful information for their fans. 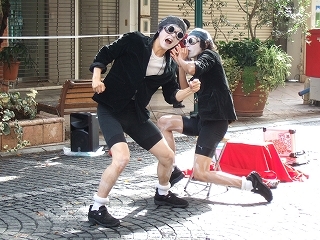 You can see them in Shizuoka also after the Daidogei World Cup in Shizuoka. 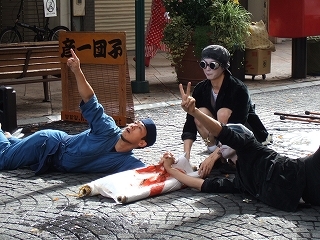 run a one-man art exhibition in Kawane Honcho by November 22, 2013. 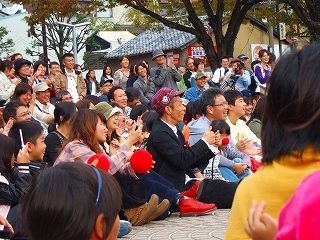 Then they come down to Shizuoka city again to participate in Street Festival in Shizuoka 2013. 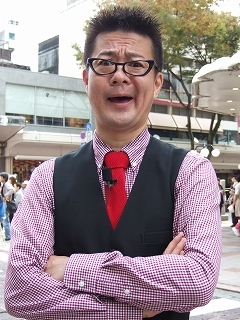 Look for "Taro Yasuda (安田太朗) on Facebook for more details. Enjoy the different world of Canard Pakinois! BLACK has been performing all over the world and making great breakthroughs. Especially this year(2013), he performed at the Cirque du Soleil as the first yo-yo artist. 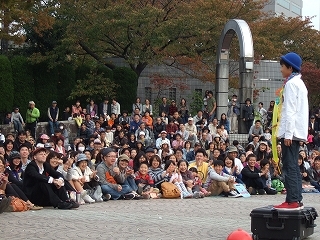 various techniques with two yo-yos, the world's first "yo-yoing tablecloth pull-away", the thrilling "coin shot" with an audience, and the Japanese-inspired original Japaneseness piece performed at the Cirque du Soleil. Audiences was always struck by his sensitive yet powerful performance. He was slightly worried about the fan's reaction in Shizuoka since it had been a while to perform in Japan. However, he felt reassured by warm-heartedly support of the fans here. We can't keep our eyes off his performance - Don't miss it! 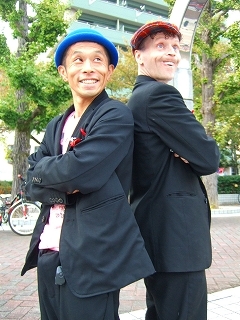 Non-stop Chatterbox / "Damejan Koide"
so that he has to keep his chin up and go forward more and more. 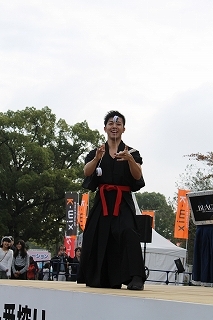 Daidogei World Cup in Shizuoka 2013 is the 21th perticipation to the festival for Damejan Koide. 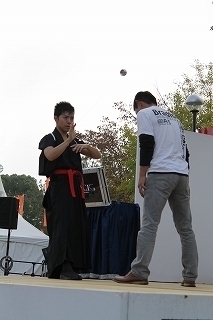 All the audience is enchanted by his various and delightful performance, such as magic and diabolo. who are looking forward to seeing him and joining in his performance. with his talkative character and sharp tongue. 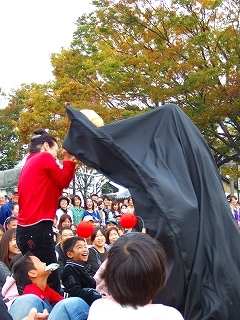 Not only children, but also adults are involved into his show and enjoy it a lot. This proves his well-polished technique to tease people. and they often trigger a miracle collaboration. 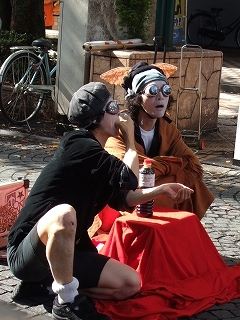 This flexible and riposte talking at sight, which go far beyond Manzai and Rakugo, can be tasted only at the venue. and he says he will show different performance at every stage. 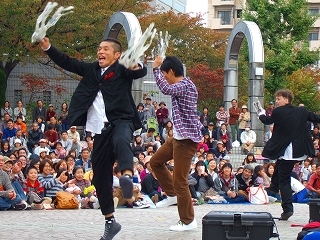 performance shows different aspects each time. savours the lingering moment. This is our show. Chris added that comedy performance is not a spectator sport. 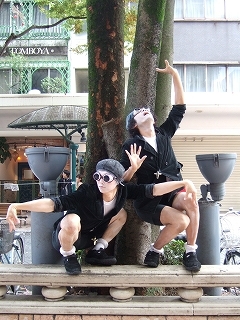 then join our performance," added Chris. even if they are beyond expectation. Especially they take children's reaction seriously. they would feel sad because they might think their clown was neglected. Verbally expressed thoghts that are put in their performance were really touching. Come, and share fun time with Funny Bones. They are looking forward to sharing time and creating a one-off show with you. Jesse and Amber are a just-married couple on the Sunday just before they flew to Japan for Daidogei World Cup in Shizuoka. Jesse said "people here are very nice and respectful to us and this festival. This is really wonderful place. We are very happy to be here!" seems to be their honeymoon. Her voice conveyed that they fully enjoy their first stay in Shizuoka. 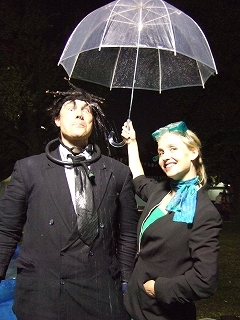 presents a cool and delightful water tricks. 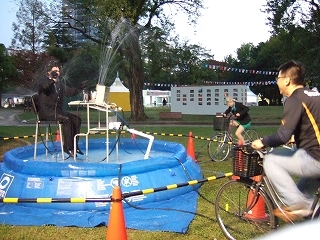 and start pedaling to energize Jesse the Human Fountain. Your help is vital to reach the climax of their performance. don't be shy, and give your hand (and legs & feet) for them!